What Is DA Form 5515-1? 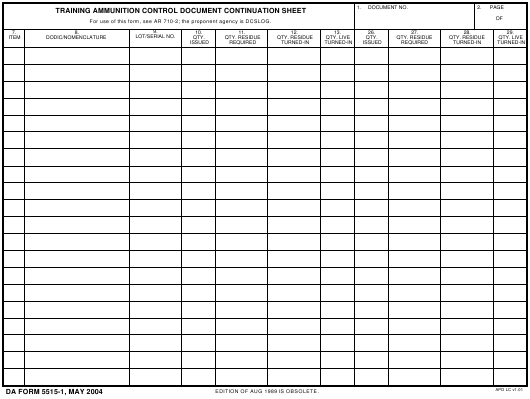 DA Form 5515-1, Training Ammunition Control Document (Continuation Sheet) serves as a continuation sheet for the DA Form 5515, Training Ammunition Control Document. Both of the forms are used for receipting training ammunition. Both the DA 5515 and DA 5515-1 forms are used to aid and help Range OICs and NCOICs to establish the minimum amount of ammunition required for training. The latest version of the form - often incorrectly referred to as the DD Form 5515-1 - was released by the Department of the Army (DA) in May 2004. An up-to-date DA Form 5515-1 fillable version is available for digital filing and download below or can be found through the Army Publishing Directorate website. For use of this form, see AR 710-2; the proponent agency is DCSLOG. EDITION OF AUG 1989 IS OBSOLETE. The 'Document Number 'box is intended to contain the number from the expendable document register filled in by the conveying party. Every subsequent issuer should use the same document number as the one stated here when distributing ammunition further. The 'Pages' box contains the total number of DA 5515 and DA 5515-1 forms issued under the same document number. The item number should be indicated in the Item box. The DOD identification code goes in the DODIC/Nomenclature box with the item nomenclature. The last entry must be annotated with the caption 'Last Item'. Each item's serial number has to be listed in the 'LotSerial Number' box with its lot number. The 'QTY Issued' box should contain the quantity of issued items. The 'QTY Residue Required' should provide the nomenclature and the amount of residue that is required for return. All other provided boxes should be left blank.